Pro-democracy leader Aung San Suu Kyi told reporters on Wednesday that the Burmese government is still restricting media freedom, and cited the case of a government ministry’s intention of filing a lawsuit against local journals for reporting about corruption within various ministries. 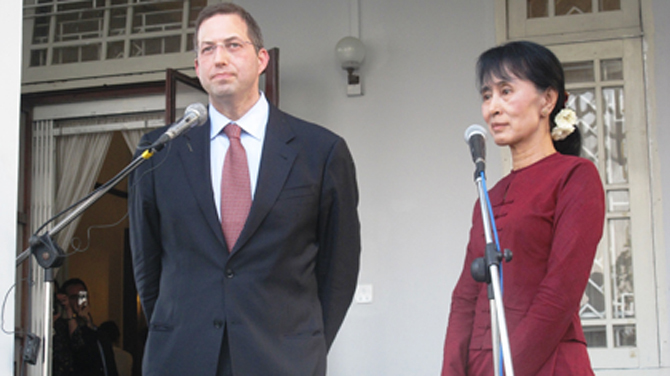 She made the statement at a press conference at her lakeside home in Rangoon following a meeting with the US envoy to Burma, Derek Mitchell. By restricting media freedom, the government is preventing the country from developing, she said, adding that an announcement by the Ministry of Mining that it will sue The Voice journal is one of the ways that the government attempts to gag the media. Suu Kyi said that media freedom is a necessity in Burma if there is to be rule of law. Her comments come just a few days after the Ministry of Mining denied allegations in The Voice that it was involved in corruption. According to state-run The New Light of Myanmar, the Ministry of Mining denied there was corruption in its ranks, and said legal proceedings would soon be launched against The Voice journal. “Amid the country moving forward to full peace and development with discipline of democracy [sic], it tarnishes the dignity of the ministry and is not ethical for the media to write like this,” read a statement from the Ministry of Mining. Based on a government audit report, The Voice and other Burmese media outlets reported cases of corruption within six key ministries with regard to the misuse of billions of kyat of government funds, as well as engaging in a variety of illegal transactions. The six ministries singled out in the audit report were: the Ministry of Information; the Ministry of Cooperatives; the Ministry of Agriculture and Irrigation; the Ministry of Mining; and the Ministries of Industry (1) and (2). The Ministry of Mining is the only government department to have responded to the allegations at the present time. Despite a statement by Tint Swe, the head of the Press Scrutiny and Registration Division, that the censorship bureau should be abolished, Rangoon-based journalists have reported that Burma’s censorship board has become more strict once again, censoring news about the controversial hydropower Myitsone dam project, the upcoming by-election, and Suu Kyi’s political campaigns. For goodness sake, wake up! Traitor SuuKyi is totally irelevant. she will sya anything to get continued support of Western pupper masters. We have very seriosu problem: democracy will turn into anarchy politi8cally and economically. Just look what is happening with the exchange rate. Traitor SuuKyi has nothing to contribute, but everything to obstruct.All she wants is power. The state of Burma is being endangered by the tratior woman. Get it? Terry Evans Wrote: 24/03/2012 "All political thinking for years past has been vitiated in the same way. People can foresee the future only when it coincides with their own wishes, and the most grossly obvious facts can be ignored when they are unwelcome." VERY TRUE. THAT IS THE NATURE OF IGNORNACE. How can the zoo keepers in the Burmese government invite foreign investments? Perhaps they want to line up the pockets of these zoo keepers with foreign investments. Let the Ministry (of Mining) sue the (Voice) Journal. Let the Journal defend at the court what it has published. Let there be fair and unbiased investigations, and fair rulings by the court. Majority (therefore democratic) wisdom would be that the Ministry would lose the case. In the era where a great majority of the government is corrupted, how will the Ministry prove it is "clean"? God must be laughing. Buddha will truly jump over the wall! A person with no brain now has become a human zoo. Every outsiders come visit the zoo. And, every visitors listen to all her complaints about the current government and put in more and more investments. Media is power without accountability. Rupert Murdoch would love you. For the Ministry or anyone to sue the VOICE, YOU NEED TO CONSIDER UNDER WHAT LAWS. No , dear morons, form the monarch. That's why we need HM King Schwebomin II. Try to understand the difference between libel and defamation. OK?
" it tarnishes the dignity of the ministry " ! Well, to be fair the dignity of all ministries went down the drain decades ago. "Let me write the newspapers of the land and I do not care who makes its laws." Corruption is a way of life in Myanmar/Burma, no doubt about it. How could a guy be filthy rich who is drawing a salary about a thousand US dollar a month - typical Sr Gen Than Shwe, Aung Thaung (Min of Ind-1), Hm ! A bamboo sleeve over a dog's curl of tail. Without media freedom no country can develop, only communist countries control media. If President Thein Sein really wants to change democratic state he should not allow any type of control over media, then the country can become rule of law. Threatening is not the way of democracy. If the ministry does involve in corruption, why not face in the court, it is government audit report showing that six ministries are involved in irregularities and corruption. Be gentleman if your want to stay as ministers in your respective ministries, do not try to make any more action of aggressive manner, please be civilized. It is my last warning for your jungle action. The corrupted Army top officers have been looting country's wealth since Bo Ne Win toppled the democratic government. Are these big crimes to point out the corruption by the medias? Every looters must have to return the public wealth and face the trial. I want to ask you, are you sure your departments and Mining Minister clear of corruption exactly. Now you're filing a lawsuit against Media, it's like your head hits against stone wall. Surprise! Move over The New Light of Myanmar! Your dark light is outdated and fast fading away in modern times and no longer relevant. Experience the New Freedom of Burma and let media freedom flourish for the people's voice and stay relevant in the future of Burma where it is free to write and write to free. All authorities from Township to Ministries should learn other neighbour countries how they are reacting medias. Roads damages, and corruptions in some ministries (may be all) are true by evidences. IF the Mining Minister denies the corruption and misuse of public funds, what about the report submitted in the parliament by Auditors General Office. All ministers must face the reality what have done in the past and they must take all charges. If they really want to participate the country development for the people, they must assure to follow national accounting standards for present time onwards. It is shameful for our country that authorities sue medias all times. Medias must be independent to write or show the public the truth. Because of hiding the truth, our country were put into the least developed and poorest country in the world and it is still in that position for the people. For 50 odd years the present corrupt junta has looted the country, ruled the country with iron fist kept its people isolated with the world,the country gone hundred years backward & these corrupt leaders are threatening the peoples' VOICE journal with suing. They should know by now that Arab Spring is very close. And many witnesses will support Voice journal, so take care Generals.